It happened again last night. After 6 years, it still baffles me every time it happens. In his defense, he didn’t know he’d be hit in the face during dodgeball. Of course, he could have also ditched the glasses because he was playing dodgeball. It really doesn’t seem to matter what the cause is, but ever since he has started wearing glasses, we know they won’t last forever. Right now, I think 9 months is the record for how long a single pair of glasses last in this house. Maybe you have one of those kids too? Buying kids’ glasses are not cheap, especially when they go through a couple of pairs a year. Luckily last night’s episode isn’t that big of a deal because we have insurance on them so I will just have to go order another pair. 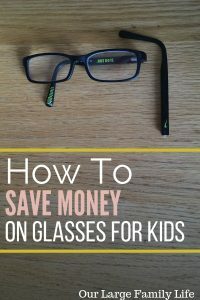 There are a couple of different things you can do to save money on glasses for kids. Let’s take a look. If you have access to vision insurance, depending on rates, this is a good idea. We only pay like 7 bucks a month for our whole family to be covered with vision insurance through my husband’s work. Insurance usually provides us will one exam a year and some money to go towards new glasses. I always make sure we get this used up if we haven’t needed it by the end of the year. Typically the glasses will be more expensive since we are buying at the eye doctor, but since they are less than a minute from our house, it’s totally worth it when we need to get them fixed, which we do a lot. When we buy from the doctor we also pay the extra money for insurance on the glasses. I am not one to buy extra insurance on anything, electronics, travel, appliances, but I get insurance on the glasses every. single. time. This means the first time we need to replace them for the year, it’s as easy as walking in and ordering them and I’m done. Ever since buying the insurance on glasses we have always used it. If your insurance offers you a health savings account (HSA) you can use the money in there to also pay for glasses. You can set money aside when you enroll in your health insurance to decide how much money you want in the account. If you expect you may have to pay for more than one pair of glasses this year, it may be a good idea to funnel some money in there to have just in case. When we are paying out of pocket, this has been my go-to place for buying kids’ glasses. They have a good selection and great prices. It’s very easy to order them, although shipping does take a little while just like when you order from an optical shop. The glasses held up as well as any other glasses we bought and it wasn’t as big of a blow when they were broken or lost, or whatever happened to them. Walmart is also a good option when you paying out of pocket. This is an easy option if you live close to a Walmart that has an optical center. If you live farther away, then I would say ordering them online may be simpler. When we went to Walmart, they had some nice clearance frames that made them cheaper. Since we have broken glasses that we have gotten from all the places I don’t find a whole lot of difference in quality. One of the best ways to save money on glasses is to not have to buy multiple pairs a year. If you have one of those kids who have trouble keeping their glasses in one piece or on their face here are some tips to help. Eye Straps. These will literally help glasses stay on the face of your child. This keeps them from falling off during play and also helps them to keep them on instead of taking them off. Sports Goggles. When our child was in sports, we got sports goggles. They are more durable for the rough and tumble parts of childhood and different sport activities. They weren’t the most comfortable, but since they were only worn for a short time period, it was worth it. Designated Spot. If there is a reason for your child to remove their glasses, create a designated spot for them to be put. This should help with preventing their loss. It also means they will be put in a safe place, instead of where someone could harm them. Multiple Cases. If your child has frequent places where they need to remove glasses, investing in multiple cases will also help them from getting lost or broken when they are not in use. 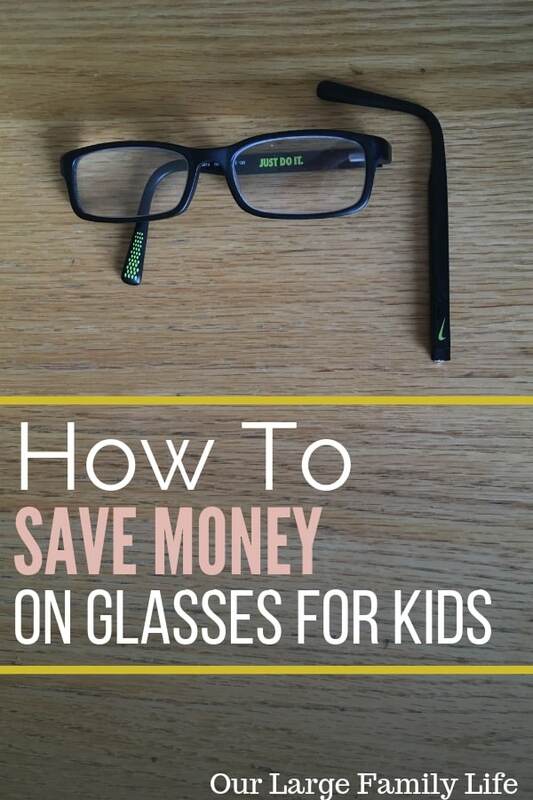 Kids in glasses can be expensive especially if you go through multiple pairs a year. The best way to save money is to plan for this to happen and plan accordingly. If you can find vision insurance that fits in your budget, that is a great way to save from the beginning. I highly recommend Zenni Optical if you want to order your glasses online. We have never had any problems with them. Walmart is also a good option when you are paying out-of pocket. Helping your kids learn to take care of their glasses will help to prevent them from getting broken or lost, although depending on your child it will still happen. What are your best tips for saving money on glasses?